A groundbreaking ceremony has taken place in Poland on the site of a €800m lignite power plant in Turów. The ceremony was attended by Poland’s Prime Minister Ewa Kopacz and representatives Mitsubishi Hitachi Power Systems Europe (MHPSE), which will build the plant in co-operation with Polish company Budimex and Técnicas Reunidas from Spain. 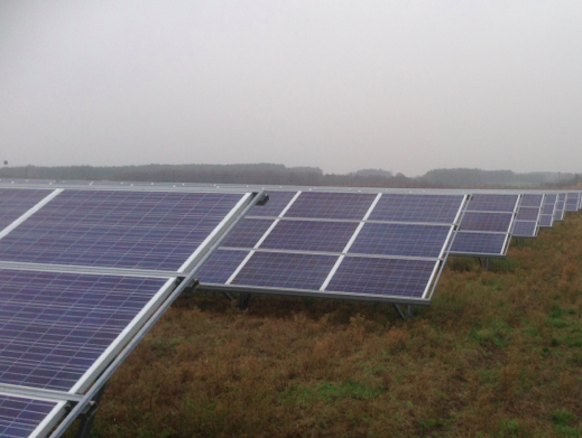 German renewables are invading Poland. Poland, the host of the climate change negotiations, is going to extreme lengths to protect its coal-fired electricity industry — making sudden changes to renewable energy support schemes, and even going so far as erecting a form of electronic barrier to keep renewable energy from neighboring Germany out of its grid. The move appears to have been made with the sole intention of protecting the economic interests of its incumbent, centralized and heavily coal-reliant grid. As Germany roars toward a decentralized, renewables-based grid, Poland appears determined to stick to the past. The contrast between the two countries could not be starker. The move to install equipment known as phase-shifters on transmission links between Poland and Germany is designed to give the Polish grid operator the power to block excess renewables output from Germany entering the Polish grid. As in Germany, a large amount of renewable energy causes wholesale prices to come down — and profits to fall. The phase-shifters are being tested in coming months and will be installed over the next year by the German network operator 50Hertz, which looks after the grid in the eastern past of the country adjoining Poland. Grzegorz Wisniewski, the president of the Institute for Renewable Energy, says the move is clearly designed to protect the income of the incumbent generators in Poland, and comes as the country is facing a looming energy deficit in a few years’ time. The reason the ‘wall’ was put up is that the Germans wanted to force power onto Poland when it could not handle any more. Renewable output is impossible to manage on the scales that Germany is planning, and Poland does not want to freeze in the dark, as is the Germany plan for 2020. Someone has clue. And it is Poland. And a guy named Tom Anderson. But that got me wondering just what is a “phase shifter” and how does it stop power from flowing? The Tech of a phase shifter is also known by the name “quadrature booster”. Nice to know about in case one ever needs a way to put a faucet in the power line somewhere. A phase angle regulating transformer, phase angle regulator (PAR, American usage), phase-shifting transformer, phase shifter (West coast American usage), or quadrature booster (quad booster, British usage), is a specialised form of transformer used to control the flow of real power on three-phase electricity transmission networks. For an alternating current transmission line, power flow through the line is proportional to the sine of the difference in the phase angle of the voltage between the transmitting end and the receiving end of the line. Where parallel circuits with different capacity exist between two points in a transmission grid (for example, an overhead line and an underground cable), direct manipulation of the phase angle allows control of the division of power flow between the paths, preventing overload. Quadrature boosters thus provide a means of relieving overloads on heavily laden circuits and re-routing power via more favorable paths. Alternately, where an interchange partner is intentionally causing significant “inadvertent energy” to flow through an unwilling interchange partner’s system, the unwilling partner may threaten to install a phase shifter to prevent such “inadvertent energy”, with the unwilling partner’s tactical objective being the improvement of his system’s stability at the expense of the other system’s stability. As power system reliability is really a regional or national strategic objective, the threat to install a phase shifter is usually sufficient to cause the other system to implement the required changes to his system to reduce or eliminate the “inadvertent energy”. The capital cost of a quadrature booster can be high: as much as four to six million GBP (6–9 million USD) for a unit rated over 2 GVA. However, the utility to transmission system operators in flexibility and speed of operation, and particularly savings in permitting more economical dispatch of generation, can soon recover the cost of ownership. So we are starting to see the stability issues and the resultant stability wars caused by too much power that can not be dispatched on demand. Thus the reasonable solution being a dispatchable power source like coal or gas turbines. Simplified circuit diagram of a three-phase quadrature booster. Arrows shown on shunt transformer secondary windings are movable taps; the windings have floating ends shown, and grounded centre taps (not shown). By means of a voltage derived from the supply that is first phase-shifted by 90° (hence is in quadrature), and then re-applied to it, a phase angle is developed across the quadrature booster. It is this induced phase angle that affects the flow of power through specified circuits. A quadrature booster typically consists of two separate transformers: a shunt unit and a series unit. The shunt unit has its windings connected across the phases, so it produces output voltages shifted by 90° with respect to the supply. Its output is then applied as input to the series unit, which, because its secondary winding is in series with the main circuit, adds the phase-shifted component. The overall output voltage is hence the vector sum of the supply voltage and the 90° quadrature component. Tap connections on the shunt unit allow the magnitude of the quadrature component to be controlled, and thus the magnitude of the phase shift across the quadrature booster. The flow on the circuit containing the quadrature booster may be increased (boost tapping) or reduced (buck tapping). Subject to system conditions, the flow may even be bucked enough to completely reverse from its neutral-tap direction. This entry was posted in Energy, Political Current Events, Tech Bits and tagged Coal, Electricity, energy, Germany, Grid, Poland, Renewables. Bookmark the permalink. I don’t know what its like these days, but it used to be fun to be at a power station when they connected to the grid. It used to oscillate and was close to going unstable. Hopefully its better than that these days. Hi, I enjoyed this post. As an electrical engineer I understand well what Poland is doing with the phase shifters. I recall discussing phase shifting transformers with a few of Pointman’s readers 1 or 2 years ago when it was being planned. I have visited Poland a couple of times now and I love the Polish people too. We are now related to some Poles through marriage … my stepson married a Polish girl. However, back to things power. I’d like to comment on another aspect of power generation and grid stability. The electric power grid has effectively no storage. The electric energy injected has to be matched precisely to the take off. The system frequency is used to monitor this. The normal power generators (gas, coal, hydro) have governors with a carefully engineered droop characteristic which adjust their generator’s output to keep the frequency. If the governors see the frequency rising, they back off their generator’s output. If the governors see the frequency falling, they increase their generator’s output. The variation made is to the prime mover, injecting more or less real power to the rotor, and it results in the phase angle between system voltage, seen as a rotating magnetic field in the machine, and the position of the rotor in relation to that. The phase angle can only go so far. 70 electrical degrees is about maximum for safe stability. Beyond that a minor disturbance can send the machine past 90 and then its on its way to losing synchronism. And within a fraction of a second the over current relays will trip the machine off line. One of the problems with solar and wind is that they are not able to respond to system need through a governor. Their output is determined by the weather at the time. They are acting to reduce the stability of the system by introducing another variability, not linked to system need, and further, they are gradually displacing generator’s which can, leaving fewer frequency keeping generators to maintain stability. He pointed out another important point; the need to get the right phase angle when starting wind turbines. With the wrong phase angle they become giant electric fans, drawing current not generating it. Occasionally seen when turbines are rotating when there is no wind. The same applies to grid connected PV; no reference electricity to ‘latch’ onto, no generation. This means that a 100% renewables grid is impossible because any blackout, for even a second, makes it impossible to start. I note that the Czech Republic is also installing phase shifting transformers to stabilise their nuclear supply. Firstly, you dump an increased supply on a market in equilibrium and prices fall. Secondly, if you are paid a big subsidy separately which covers your costs (& possibly more) then you have no incentive to care about the price received. Even, at times, paying users to take it. e.g. if I were making an electric sports car (the Volta?) and it cost $160,000 to make. With a subsidy of $140,000 for each unit, I could sell it at $40,000 and make a profit, especially if other car producers had to pay all the servicing costs. No subsidy, no sales (much as in Poland when they don’t subsidize renewables). Thirdly, the approval given to cutting the profits of the essential suppliers reveals the socialist background of the supporters of renewables. This is why the net effect of increased renewables in Germany has been to drive out of business those methods which can handle variations with less CO2 emissions but higher cost, leaving the grid less stable, and emissions increasing because plant has to be run as rolling reserve while the renewables are running. I don’t think that a single enthusiast for renewables understands that a coal fired power station doesn’t start up from cold in a minute or two, rather than 2-3 days. I rather doubt renewable enthusiasts have any understanding as to the requirements to maintain a working Electrical supply system. Far Too complex for their simple minds to grasp. There will always be people who cannot set up their own power station, whether from lack of money, lack of space, or used to being spoon fed on social welfare. They will be the real sufferers, for as the demand for electricity drops the cost will rise. There will be pressure to shut down all conventional power stations and chase the “holy grail” of 100% renewables. Unless the Government starts subsidising the suppliers out of rising taxes, they will have to pay the real cost of these. Thus they can expect current bills to more than double. I think that their idea is of a big pond of electricity somewhere, and it doesn’t matter when you put some in or take it out. Electricity supposedly acts like water. And you can’t get them to understand that this isn’t the case. Oddly enough, a decentralised system would likely result in higher CO2 emissions as diesel or gas driven generators would offer far better reliability, so would CHP systems where the ‘waste’ heat can warm houses and offices most of the year. e.g Denmark has over 600 small CHP units feeding hot water to the surrounding suburbs (over 80% efficient in winter). I haven’t any idea of the annual temperature where you live but if it is 8℃ like Copenhagen, or less, then there would be every reason for you to look into it. We had one startup firm in Australia which has transferred its activities to Europe because most of the population lives where the annual temperature is almost double that, and the economics were very poor. No one wanted heating when the day was 30℃ or more. But the point is just that as soon as it goes unstable, folks react and “grow there own”, even large companies. I have gone from 100% All Electric Kithen, to doing about 1/2 my cooking on gas, charcoal, wood or kerosene. It will be more this summer as I now have a large Webber grill with lid suitable for use as an oven. (3 burner) I’ve done bbq chicken and roast potatoes at the same time on it. Next will be adding a pan of quick bread and iron pot of beans for the whole meal via gas substituted for electrons. “Calpine Corporation is a Fortune 500 power company founded in 1984 in San Jose, California. Gray Davis was from 1999 to 2003 recall. So started in San Jose (i.e. Silicon Valley) using cheap nat gas and gas turbines to deliver power to folks. Gray gets in, and things go all wonky. Enron has a bubble burst, and governments screw around in the markets more, there’s a failure / downturn of California markets / economy then too. Along the way they had a ‘time of troubles’ as nat gas prices shot up and sales fell. The Wiki paints it as a bankruptcy due to the California Energy Crisis, but when I look at the time line, they were growing then, only failing after a major investment bank started shorting the hell out of them, and long after Gray was gone. Caught up in the Enron news and more government jerking around of who could charge what for power. I’ve bolded the span of the power “time of troubles”. 2001: Established Canadian headquarters offices in Calgary, Alberta Canada. 2003: Calgary Energy Centre in Calgary, Alberta Canada goes online. 2004: Investment bank Lehman Brothers begins shorting Calpine, with researcher Christine Daley lacking confidence in the Calpine Chief Financial Officer, the accounting, and the high debt. This information spreads to clients of Lehman. By the time Calpine goes bankrupt in 2005, Lehman will profit roughly $100,000,000 from the short. 2005: November: CEO Peter Cartwright and CFO Bob Kelly are fired. 2005: December 20: Calpine files bankruptcy, US$22 billion in debt. Calpine’s aggressive leveraged expansion plan was unsupportable in the economic environment formed by the 2000-2001 California energy crisis and the collapse of Enron. Stock price dropped to less than US$0.30 per share. Delisted from NYSE. 2009: Moved corporate headquarters from San Jose, California to Houston, Texas. To me it looks like a cautionary tale about governments ability to screw up companies and the hazard of predatory financial companies. At any rate, they kind of started the whole “small gas turbine near you” power plant market. Cisco had one installed on the side of their campus build out and consumed the supply from it. (One of the ‘features’ was that avoided the need for a grid upgrade to bring that much power in from elsewhere). That same kind of thing will happen in spades with low natural gas prices and high electricity prices. They are selling like crazy, but not making profits, also doing diluting stock offerings, so not investor friendly at all (thus the stock price plunge since 2014) but their product is a nice package for anyone in the 30 kW to several hundred kW demand range. Easy peasy for any company (and even large mansion owners…) to cut ties with the “grid” if desired and make their own electricity. The local high school put one of these in to provide heat for the swimming pool. Same gas consumption as their prior pool heater, and they get the electricity for “free”… Expect to see more of that kind of thing as electricity prices go nuts. Realize that at the 30 kW size, even a small apartment block can have their own power supply (and keep the pool heated for ‘free’…). Calpine also faced troubles from local governments, specifically the City and County of SF. I don’t remember the details, but I think the “Environmental Justice” movement closed down their plant in SF.